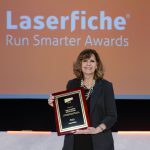 LONG BEACH, CA (Laserfiche)—January 26, 2011—Laserfiche has announced the winners of its annual Run Smarter Awards program, including UK-based South Essex Partnership NHS Trust (SEPT). 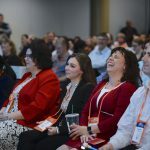 Each year, Laserfiche honors organizations that succeed in promoting organizational agility through innovative use of Laserfiche enterprise content management (ECM). SEPT, which provides services for people with mental health problems and learning disabilities, serves a population of 1.5 million across three counties, with over 3,500 employees and an operating a budget of more than $300 million. “Initially Laserfiche was envisaged solely as a clinical and medical records solution, but its initial effectiveness, coupled with the fact that it can enable shared but secured access to patient records on the network or remotely, has inspired true enterprise adoption,” said Dominic Malvern, Head of System Development at SEPT, adding that Laserfiche reseller ScanDoc/Fortus played an integral role in the project’s success. 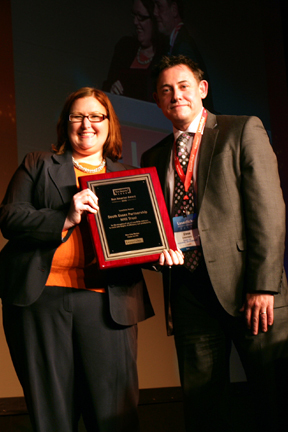 Steve Livermore, managing director of ScanDoc Ltd., accepts the Run Smarter Award on behalf of his customer SEPT from Melissa Henley, Laserfiche Marketing Communications Manager. In addition to serving as an active patient records management system, Laserfiche is now being implemented in non-clinical areas such as HR and Finance. By standardizing on Laserfiche, SEPT is eliminating the need for multiple departmental systems—and their corresponding service agreements and upgrades. “Realistically, Laserfiche will save us US$1.5 million over the next three fiscal years,” Malvern concluded. Other 2010 Run Smarter winners include: Central District Health Department of Boise, ID; City of Maple Grove, MN; Dallas Associated Dermatologists; Durham County, NC; ECOM Atlantic; ESSAR Group; Hamilton-Wentworth School Board; London Borough of Tower Hamlets; Long Beach Police Department; Mille Lacs Band of Ojibwe Indians; NE Metro Intermediate Schools; Pulte Mortgage; Spire Investment Partners, LLC; Texas A&M University Kingsville; Virginia Port Authority; and Wythe County Community Hospital.